Dancing Drums is another Scientific Games’ TwinStar J43 cabinet slot that belongs to the same series of games that houses 88 Fortunes, and delivering the same great Fu Fly feature along with the popular Fu Babies Jackpot, yes, the Fur Babies are back! 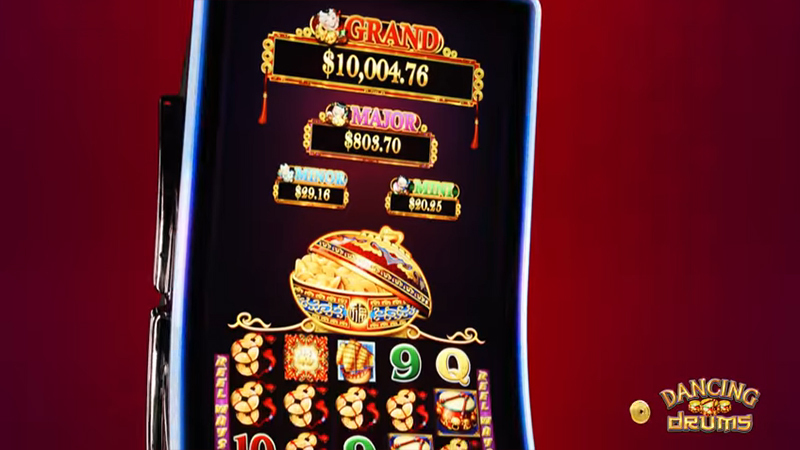 The Asian themed slot is described by Scientific Games as “Curved Portrait-Style”, because of its 4K monitor, iDeck touch-screen and for its intensive interaction values. Dancing Drums slot has everything to offer with very little left out in terms of what a slot player is looking for. Scientific Games designed Dancing Drums with the same level of entertainment as the rest of their slots. Asian cultural symbols are included in the game such as drums, golden ships, lions, golden lotus and a few more cultural themed symbols. Discover your fortune dancing your way to the bank with every spin of the Dancing Drums slot. With 5-reels of nonstop action, 243 paylines and multiple reel sets, you are guaranteed endless entertaining fun with free spins, wilds, jackpots and multipliers. Dancing Drums slot is considered a penny slot because it offers low minimum wagers as low as pennies on the dollar. It can be found in the penny slot section of any USA based casino. Max bet is $8.80 per spin! What’s more to love about the Dancing Drums slot than the Asian theme itself, and that it’s a SG Gaming title? This is an easy question to answer! There are tons of rewards to win including the free spins feature. Once the bonus feature is triggered you must choose from four different playing options. The first one is 15 free spins played on a 3×5 reel set, 10 free games playable on a 4×5 reel structure, 5 free spins on 5×5 reels or 3 free games played across a 6×5 reel layout. No matter which free games feature you choose, all games are open to triggering additional free spins if more Drum scatters appear anywhere on the reels. What makes the free spins feature so interesting is that depending on which set of free games you choose your paylines expand. The 15 free games option boasts 243 ways to win while the 10 free spins option expands to 1024 ways to win, 5 free spins offers 3125 ways to win, 3 free games increases your chances to 7776 ways to win and then finally there is a mystery pick. This option lets the game choose for you with the amount of free games you in remains a mystery until you choose this option once the feature is triggered. Your achieved rewards will depend on how much you wager per spin. The paytable is player-friendly showing how much each winning combination pays out, and is adjustable to your wager. The more coins you wager per spin just multiply the winning amount by your stake and that’s the total payout, unless you win one of the jackpots of course! There’s good reason why Dancing Drums slot is one of the more popular games across casino floors! The Fu Fly Feature activates when a wild symbol appears across the screen. When this happens, you pick from 12 lucky gold coins to match three of the same Fur Babies to win the corresponding progressive jackpot. If you match up three of the same symbols and you didn’t win the jackpot, no worries it will trigger again giving you more opportunity to try again. You have better chance at triggering either the Grand, Major, Minor and Mini jackpots with betting more per spin. Although, max bet isn’t required to trigger one of the progressives your chances significantly increase with a bigger bet. SG Games claims that the Grand jackpot is hit 10x more frequent than their previous slots that features the jackpots. Dancing Drums offers a great theme, payouts and interesting factor with its Fu Fly progressive feature. 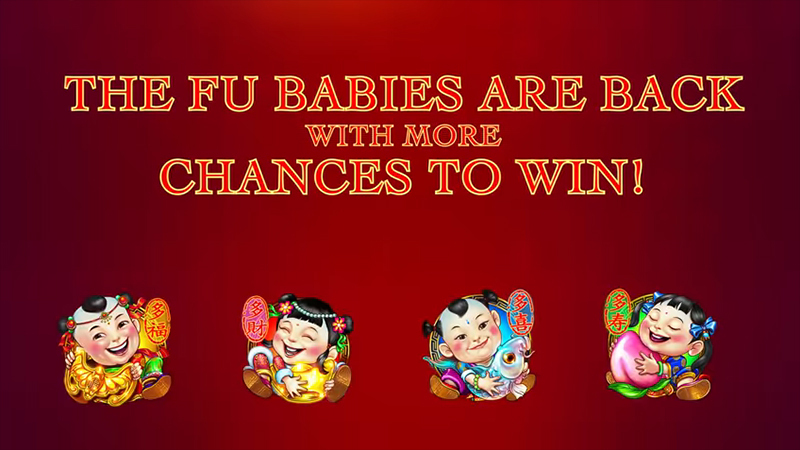 SG Gaming got it right when they decided to bring back the Fu Babies, but in a different setting. Their games or series of games are proving that they are here to cater to USA players as well as take care of the online audience. If your looking for profitable payouts with every spin, look for Dancing Drums slot next time you visit a land-based casino!